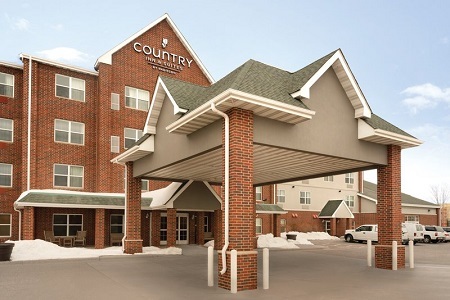 Situated off I-35W, the Country Inn & Suites® by Radisson, Shoreview, MN provides comfortable rooms and suites 15 miles north of Minneapolis. 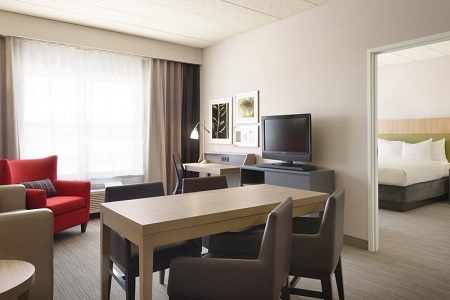 Our location lets you experience the best Twin City attractions like Mall of America® without the big-city hassle. Ideal for visiting teams, we’re also near the National Sports Center, the world’s largest amateur sports venue. Ready for some relaxation? Head to the indoor pool and waterslide. Before hitting the road in the morning, bring your whole family or team to our hotel’s dining area for a free, hot breakfast. Need more room for your teammates and their gear? 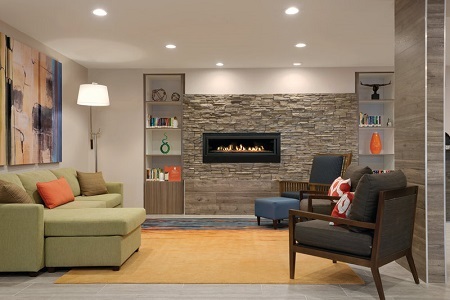 Book a One-bedroom Suite, which features a separate living area with a sleeper sofa and an extra TV. You can start your day with a freshly brewed cup of coffee and a waffle topped with strawberries and whipped cream when you take advantage of our free, hot breakfast. For lunch and dinner, try nearby restaurants like Broadway Pizza, famous for its award-winning recipes straight from Italy. Como Park Zoo & Conservatory – Travel just 20 minutes to find your wild side at Como Park Zoo & Conservatory, where you can watch the antics of Arctic foxes and the graceful movements of snow leopards. Be sure to find Toby the turtle for a photo op before heading to the bumper cars at Como Town. National Sports Center – The largest amateur sports facility on the planet, the National Sports Center houses everything from golf and soccer to cycling and volleyball, and it’s all only five miles away. Between games, you can participate in fitness classes or sign up for a private golf lesson. Science Museum of Minnesota – From Native American jingle dresses to Egyptian mummies, the Science Museum of Minnesota will entertain and educate your family with its innovative exhibits, only a 25-minute drive from the hotel. You can create a tornado, pose with a triceratops and be a captain for a day aboard a real towboat. 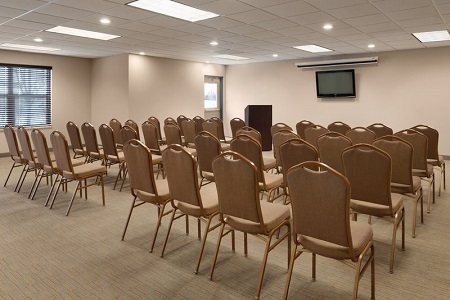 Plan a training session or a post-game party in our meeting space, which offers free Wi-Fi, audiovisual equipment and the service of our friendly staff. If you’re here for a National Sports Center tournament, reserve a block of rooms for your group using our sports team discount. Sun, 9:00 a.m. - 11:00 a.m.; 4:00 p.m. - 8:00 p.m.
Mon-Thu, 4:00 p.m. - 8:00 p.m.
Fri, 4:00 p.m. - 10:00 p.m. Sat, 9:00 a.m. - 11:00 a.m.; 4:00 p.m. - 10:00 p.m. Pool and birthday parties are by appointment only. Please contact the hotel for more information. Block cancellations must be made 48 hours prior to arrival. Your block may have a minimum number of nights required. In the event of a no-show, a one-night-stay will be charged and the remainder of the stay canceled. Please contact your group coordinator or the hotel for more information.